SubAdults Arrive and Fighting Begins! Nothing more frustrating as a purple martin landlord than seeing your beloved birds breaking out in heated battle. I am sure (from past experiences) that it will get worse, but nevertheless, watching your kids beating each others heads in is hard to watch. I have long since given up caring what the neighbors think, but 5 minutes into yelling up at the MPP pole for the martins to, “QUIT IT!! !”, I did notice the ridiculousness of it all. The martins ignored me and untill I lowered the pole, the SY male wouldn’t stop trying to enter the Sunset Inn house. Once lowered, the ASY male and female sat in the compartment quietly. I opened the room and reached in to remove the ASY male (to check for any lasting injury. The female just sat and didn’t move a feather. She stayed the whole time. 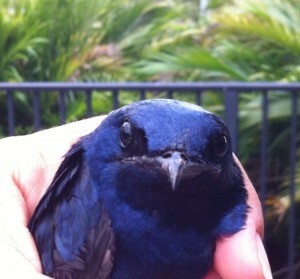 I released the male, raised the housing and all was well…for a few minutes anyway. On another note, we have gotten a few new items at our store, www.PurpleMartins-R-Us.com. These cool Purple Martin metal Silhouettes are both functional and decorative. I can’t decide if I want to attach some to the top of my Aluminum house or up on top of my kitchen cabinets.